'2 it mwta mava<laa COS (p d/l o is the meridional transport of fresh water in the atmosphere. The latter is unambiguously related to the meridional transport of water vapour defined by the division of MWTA by (pA/pQ). 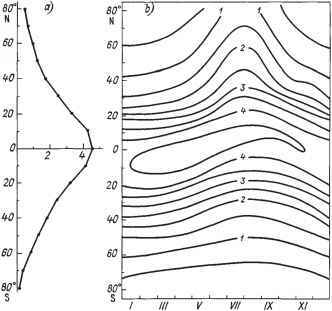 The dependence of (Pa/Po)MWTa on latitude is shown in Figure 2.10. Even a quick glance is enough to see two interesting features: first, the strong seasonal variability of the meridional water vapour transport in the tropics, and its almost complete absence in the middle and high latitudes of both hemispheres; second, the existence of considerable water vapour transport from the Southern Hemisphere to the Northern Hemisphere in summer and of the slightly smaller reverse transport in winter. Thus, it turns out that the Southern Hemisphere is a source of water vapour for the Northern Hemisphere. Water vapour transport across the equator plays an important role in the formation of the water balance of both hemispheres. Suffice it to say that it is this transport that controls the relation between precipitation and evaporation and, in particular, the excess of 39 mm per year of precipitation over evaporation in the Northern Hemisphere (see Peixóto and Oort, 1983). Next, if we look at this from a more universal point of view then we will see that the presence of water vapour transport in the atmosphere across the equator serves as indirect proof of the presence of a reverse (directed from the Northern Hemisphere to the Southern Hemisphere) fresh water transport in the ocean and/or on the land: for the annual mean meridional moisture transport in all subsystems of the climatic system must vanish. On the basis of this consideration and estimates shown in Figure 2.10 we conclude that the meridional fresh water mass transport in the ocean and continental parts of the hydrologic cycle should be directed to the south in middle latitudes of the Northern Hemisphere as well as on the equator and in the tropics of the Southern Hemisphere, and to the north in all other latitudes. Evaporation and precipitation. For some latitude zones the difference between precipitation and evaporation is defined not by the meridional water vapour transport but, rather, by its divergence (see Equation (2.4.10)). Say, if the divergence dMWTJa ckp is positive then ([£] - [P]) > 0 and, hence, the latitude zone where this inequality is valid serves as a moisture source for the atmosphere. On the other hand, if in some latitude zone ([£] — [P]) < 0, then a moisture sink takes place there. The annual mean meridional distribution of dM WTJa Sep signifies the fact that the tropical regions of the ocean serve as a main moisture source for the atmosphere, and the equatorial zone and temperate and high latitudes of both hemispheres serve as a sink. But if that is the case then the interchange of moisture sources and sinks in the atmosphere must have important consequences for the meridional distribution of water salinity in the ocean: where evaporation dominates over precipitation, the salinity of the ocean upper layer has to increase; otherwise it has to decrease. 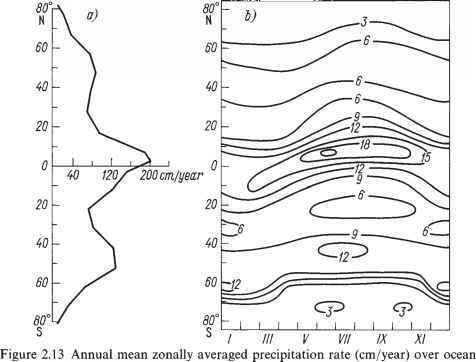 Comparison of meridional distributions of annual mean zonally averaged values of the evaporation minus precipitation rate (Figure 2.11(a)) and the surface salinity in the World Ocean (Figure 2.11(b)) confirms the marked regularity. 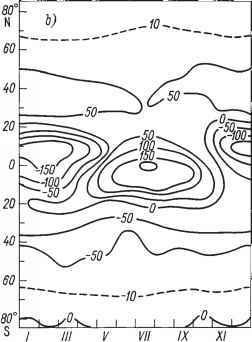 From this it follows that the determining contribution to the formation of sea surface salinity, at least in equatorial and tropical latitudes, is from evaporation and precipitation. 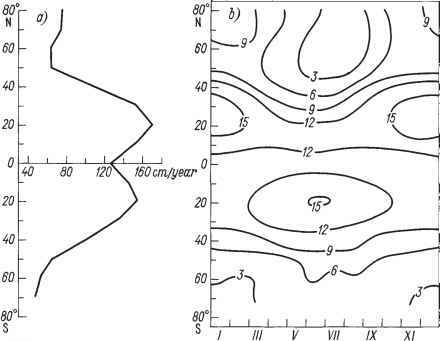 All other factors (including horizontal advection and vertical diffusion) play a secondary role. 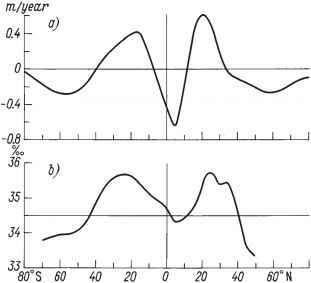 Figure 2.11 Zonal mean profiles of evaporation minus precipitation rate (a) and the salinity at the ocean surface (b), according to Peixoto and Oort (1984). than in the tropics of the Southern Hemisphere in summer. In the equatorial region evaporation is less than in the tropics due to decreasing sea surface temperature and weakening wind velocity. It can be seen from Figures 2.12 and 2.13 that the annual mean meridional distribution of precipitation and evaporation is not symmetric, and their seasonal variations are not antisymmetric about the equator because of differences in land and ocean areas in both hemispheres. It will be recalled that everywhere other than the tropics the precipitation over the ocean is generally larger than over the land. If we add the fact that evaporation from the ocean surface is larger than that from the land surface, then it follows that evaporation and precipitation are compensated locally. But their compensation can only be partial in the sense that the resulting value of the difference between evaporation and precipitation must be negative on the land and positive over the ocean. Otherwise, the existence of river and underground run-off simply becomes inexplicable. Thus the atmospheric part of the hydrologic cycle must include the water vapour transport from the ocean to the land, and the continental part must include that from the land to the ocean. Continental run-off. According to Equations (2.4.6)-(2.4.8) the annual mean difference between evaporation and precipitation for the land surface, on the one hand, and evaporation and precipitation for the ocean and sea ice surface, on the other, must be equal to the value of continental (river and underground) run-olf from the land into the ocean. This value, together with estimates of global evaporation and precipitation, is given in Table 2.3. 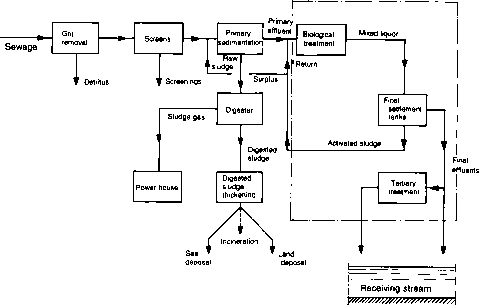 As can be seen, all estimations of the run-off, except for the estimation by Bryan and Oort (1984), are in agreement with each other in spite of large systematic errors in precipitation measurements and unavoidable errors in calculations of evaporation, caused, among other things, by the extremely irregular distribution of data of meteorological measurements over the ocean, and by still insurmountable difficulties in determining soil wetness on the land. run-off in the Northern Hemisphere, and the fact that these variations are in phase. The first feature is determined by the asynchronism of the continental run-off variations in the Northern and Southern Hemispheres; the second feature is caused by the prevalence of the run-off in the Northern Hemisphere over its value in the Southern Hemisphere. Let us take advantage of the estimates from Tables 2.1 and 2.3 for the annual mean precipitation rate (1 m/year), river and underground run-off (0.3 m/year) and sea ice melting (0.5 m/year). Dividing the total moisture content in the atmosphere (water equivalent equal to 0.025 m, see above) and fresh water content in the ocean (3700 m) by the first of these estimates, the fresh water content in lakes, rivers, marshes, soils and underground waters (78 m) by the second estimate, and the fresh water content in the sea ice (1.5 m) by the third estimate we have that the times of fresh water renewal in the atmosphere, sea-ice, land and ocean are nine days, three years, 260 years and 3700 years respectively. Let us start with the derivation of energy budget equations and then discuss the mechanisms of conversion from one form of energy into the other and the redistribution of energy between the ocean and the atmosphere.